Feeling rich is the difference between just existing and being gloriously, deeply, passionately alive, living the very best life you were born to lead. What does feeling rich have to do with actually being rich? Plenty, it turns out. Your beliefs and feelings about money drive how you see yourself and how you define "rich." Explore your needs, values, and beliefs--what does true wealth look like for you? Learn how your life experiences created your money beliefs and habits. Understand how to replace destructive money habits with those that support your vision of a happy life. Create a just-for-you action plan to meet your goals and start living richly. Sometimes you need help to energetically and purposefully pursue the life you crave. 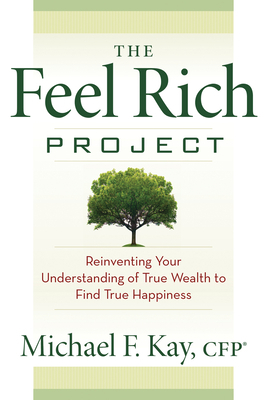 The Feel Rich Project is an inspirational but practical guide to help you build your true wealth, a compassionate, warm, momentum-building program for all who dare to seek meaning and joy. Michael F. Kay is a financial life planner and CFP® who has helped thousands of women, men, and families master their financial lives, a process that almost always includes uncovering--and planning for--what they value most. He's president of Financial Life Focus, a fee-only, multi-advisor, financial life planning firm, and the author of The Business of Life. Named by Twitter as one of the top 35 personal finance experts, his financial advice has been featured in Forbes, Psychology Today, Fox Business, and the Wall Street Journal. He lives in West Orange, New Jersey. "Money is emotional…and very few people can help you navigate that reality better than Michael Kay. Consider this book your map!" "What does it really mean to be rich? This is a key question that Michael Kay explores in a book that challenges you to define or redefine the meaning of wealth."